Would You Rather Stand Or Sit At Your Desk All Day? The latest office trend sweeping the nation is stand up desks, according to the Wall Street Journal. A growing number of employees at companies like Facebook and Google are tossing aside their chair and asking to work while standing. 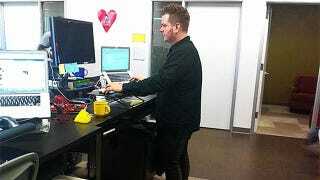 The stand-up desk has a raised surface that is the proper height for a person to stand and type. Though it looks uncomfortable to stand all day, it may provide a healthy alternative to sitting which is thought to cause obesity, blood clots and premature death.